If you want your artwork file to print properly as a banner, it is essential that you have your fonts converted to outlines. If you do not submit files with the text converted, your font will be converted to a default font. 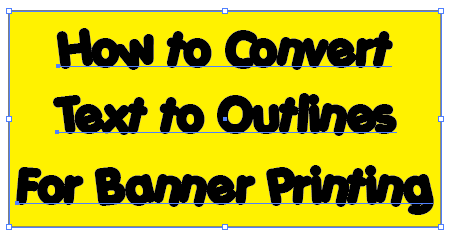 When you convert your text to outlines, your text turns into a vector image. The text is no longer editable. Once you have designed your artwork in Adobe Illustrator and you are ready, select all of the text. You can tell your text is still a font because it will be underlined. Go to the toolbar and click on the "Type" menu. Click on the "Create Outlines" button. You can also use the command keys (shortcut) "Shift+Ctrl+O" on a PC or "Shift+Com+O" on a Mac. When your text is converted to outlines it will have vector paths around the letters. You will be able to resize the images without losing resolution. 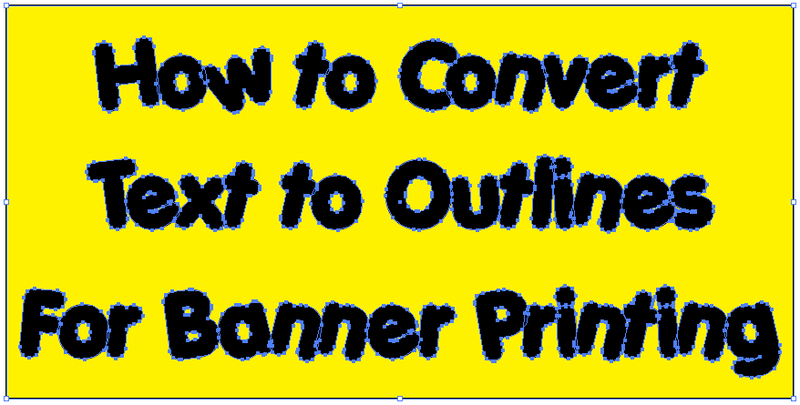 When your files are ready, click here to get started on your Vinyl Banner!